Today I bought the DF 500 Q. What an investment, hope it's worth the money. Reason for this is I have to build 4 different cabinets for my new home and I want to do it as precise as can be. Most cabinets will be of 15 and 18mm plywood with HPL . Because of the HPL, I have to cut the edges to 45 degrees, so you won't see the plywood itself. And these 45 angels have to be glued together and that can only be done by using lamello's or domino's to align them really nice, I think. So, bought the DF500 for that. I'm using the smallest domino available, the 20mm domino (which is in fact 18,2 mm) and the 4mm domino bit. However, for some drawers I could use 12mm plywood, but, I'm not sure what the minimal thickness at 45 degrees is for the domino. I think 12 mm will not work for bevel cuts and joints. However, I can't find a table where the minimal thicnkess of material is related to the used domino in case of bevel cuts. Is there something available or should I try and error? Giving this a thought, maybe the lammelo would have been a better option for this kind of stuff, because the 0 lamello is just 15 mm width, so, probably more suitable for smaller, less thick plywood. What do you guys think? 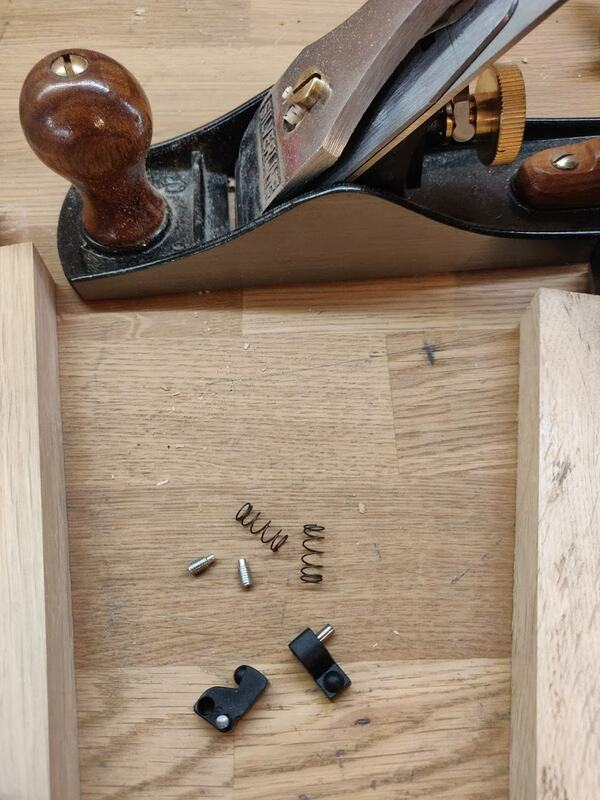 I've used 4mm dominos in 12mm ply to build drawer boxes previously and it worked really well. Although that's at 90 degrees. I think that's as low as I'd do because below that you're likely to be at 9mm so with a 4mm domino that gives you 5mm of material left which is only 2.5mm either side of the domino hole. 45degrees may work but you may find that your Dominos are too long. With a 90 degree angle you can offset the domino ie one end goes 14mm into the wood and the other side is 6mm etc. With 45degrees you can't do that. I don't like to do beveled joints with plywood. A bump cam expose the core material. I use a solid piece of 1X1" hardwood at the edges. That eliminates all the Domino thickness issues. It also eliminates the bevel issues. I am not sure exactly what @Birdhunter is saying, but I sense it is correct. We probably need a picture. The Lamello works fine on 1/2" (12-mm) material, but the end result can be not too stunning as there is not a lot of stiffness in a 1/2" thick sheet. The 16mm sheet, or thicker works better. I am using the smallest ClampX. Basically the Lamello is the superior tool for sheets, as all the fasteners one needs are there... ClampX, Tenso, etc. and it only really does sheets. It is not much use for solid wood, where the domino is better. A lot of people make the domino work for that sort of stuff though. I also recently got a Domino and prefer it to the Lamello tremendously. I think you made the right choice. This was mentioned in an "Additional Domino stops" thread here... look it up, it's full of good tips! The center depth of a 12mm 45 degree bevel is about 8.5mm. And on 15mm is about 11mm. Those are at the center line so at 2mm (4mm domino) off the center it will be a little less. I don't see that working on 12mm. 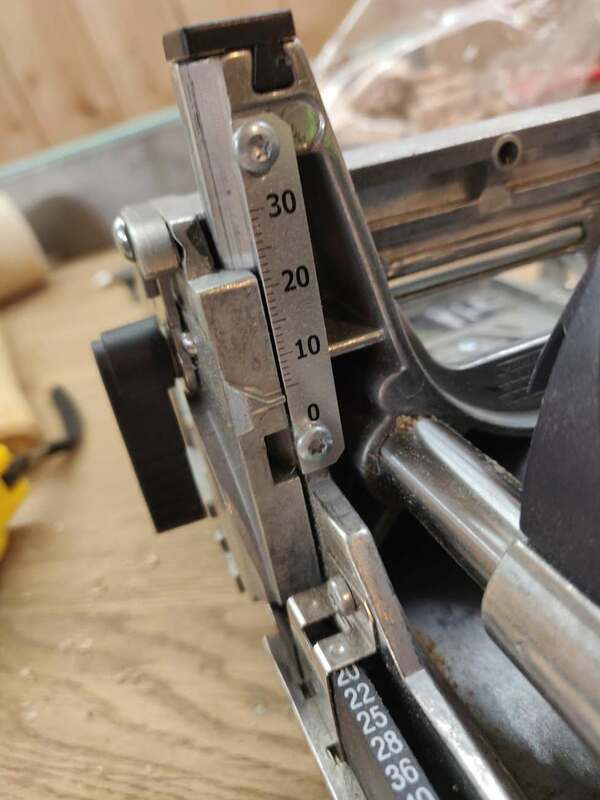 Even on 15mm you will need to shift the mortise off center towards the inside and even then it will be very close , possibly too close for practical use on a whole lot of mortises. To make this work reliably you will need to make shortened dominos and restrict the plunge depth with some spacers as grobkuschelig suggested or something similar. 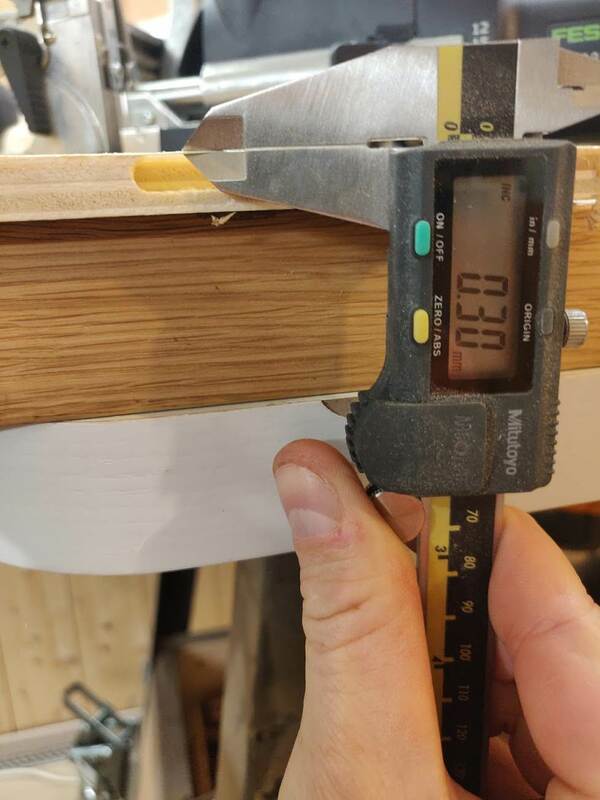 One thing to note when doing connections of this type or in general is that the Domino mortise depths are accurate but the dominos are a couple mm short of the stated length. I am wondering why the minimum stock thickness of wood in which you can center the domino using the fence is not indicated in the manual. So I checked on my Domino and it is possible to exactly center a domino in 7 mm wood (so with a 4 mm domino, it leaves 1.5 mm on each side). Also, I am wondering why the fence scale is not graduated below 5 mm ? 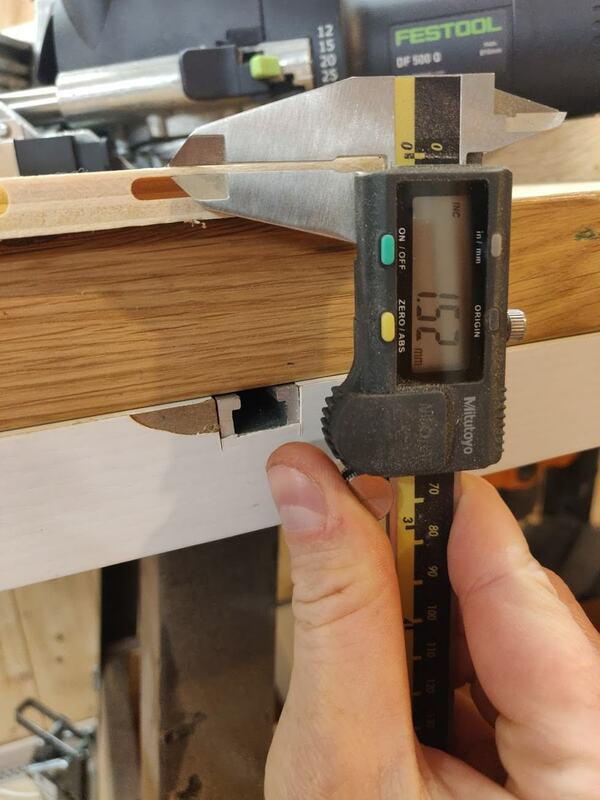 The lowest position is 3,5 mm, so with the 4 mm bit it leaves 1.5mm wood on top of the mortise (pictures below made with 10mm plywood, I do not have any 7mm plywood). To lower the fence scale to 3.5, you have to remove the plastic stop pins (otherwise it is blocked at about 4). Do not do that with the 8 or 10 mm bit, otherwise it will damage the plexiglas window ! With the 6mm only some 10th of mm are left above the bit. I have the Lamello Zeta P for sheet goods. The Lamello with a Clamex P-10 (and Bisco 10) needs a minimum thickness of 16mm for a 45 degree mitre angle. 12mm at a 90 degree angle. The Lamello configurator will give you the best connectors for a specific angle and thickness http://www.lamello.com/p-system-configurator/ It is a super flexible system for building any sort of wardrobe/cabinets. With standard wood biscuits I've used the Lamello #0 biscuit for 90 degree in 12mm but I'm not sure about a 45 mitre. The biscuit is 15mm / 2 depth needed on each part. the Zeta P is probably a nice machine, but according to the Lamello configurator, a connection is not possible with plywood < 12mm. Yes. Although the configurator is for the Zeta thicker connectors and doesn't include the standard 4mm biscuits.